Years ago I worked as a flight instructor at a small flight school in Florida. Our customer base ranged from teenagers who aspired to become airline pilots or aeronautical engineers to retirees who wanted to finish up a 40 year old dream of learning to fly – work and life had gotten in the way. Some of our customers were airline pilots who just wanted to get “checked out” in a little plane, others were tourists visiting Orlando who wanted to do some flying in Florida. Flying captures the imagination of all types of people and I met a lot of good people there. One customer I will never forget was a young man from France, Patrick. He would come in every day for a week or more and then not come in for a few weeks on end. Patrick was polite and worked hard but he struggled a bit in the airplane and at times we had difficulty communicating. At first I thought it was because of his English proficiency but then I realized some part was due to mental block. Patrick was very shy if you will. I realized quickly Patrick wasn’t making progress as fast as most. We were a “Part 61” flight school which means the curriculum is rather informal, each student makes progress at their own pace. We didn’t have programmed stage checks but instructors regularly asked their peers to fly with their respective students, just to get a second opinion, give the student an opportunity to be evaluated by a fresh set of eyes. One day when I thought Patrick was close to being ready to solo I asked Mark, another instructor, to fly with him. After the flight Mark shook his head and told me he didn’t think Patrick was close. Something was different about Patrick but I couldn’t quite figure out what it was. I was young(ish) and struggling to make a living as most all flight instructors do. I didn’t feel like it was my place to decide who should be taking flight instruction or who should not – as long as the person is safety oriented and shows good judgment. I don’t remember who told me but someone pulled me aside in the lobby of the FBO and asked if I knew Patrick was spending the nights sleeping in his car out in the airport parking lot. Apparently people had noticed Patrick sleeping in his car and asked if he was OK. Patrick seemed to be more comfortable talking to the line men and he had confided in one of them, told them he lived out of his car, he’d spend a week at the airport and then go to work as a road construction laborer for a few weeks. Every time he’d go away to work he’d save his money and then come back to the airport to fly. As we struggled to make progress I knew Patrick was becoming frustrated. At the urging of the line man in whom Patrick confided, I manned up and told Patrick one day that flying airplanes isn’t easy, some people take more time than others and that I would understand if he chose not to continue, if he chose to save his money for other purposes. I told Patrick there’s no shame in doing the best you can no matter what the outcome of the training, but we have to be safe. He told me he wanted to continue just a bit longer. I think Patrick felt better after we talked. No longer focused on a timeframe or given outcome, he wasn’t frustrated with himself anymore. And then one day it seemed like things “just clicked”. Like most students, all of a sudden there was a moment where Patrick became consistent and capable of flying the airplane around the pattern without my help. After 30+ hours (the typical average at our school was about 12-15) Patrick appeared ready to solo. I flew with him several more times because I had to be sure. Patrick never regressed and about 38 hours into his flight training, I got out of the airplane and told Patrick to fly around the pattern. I waited by the taxiway and after Patrick landed I told him to do 2 more trips around the pattern. I felt comfortable watching Patrick solo. Despite my earlier frustration I knew he’d mastered flying the airplane around the pattern solo. After his third landing I told Patrick to park the airplane, he was beaming. His friend the line man was as happy as I’d seen him in nearly 2 years of flight instructing there. Mark, the other CFI, congratulated us and told me, “Ward, I just have to shake your hand on this one.” He later told me he didn’t Patrick would solo. I never saw Patrick again after that day. He left to go work again, he seemed satisfied and comfortable with the decisions he’d made. I barely grasped the significance at the time, I was young and getting by from day to day. I taught a homeless man to fly. He taught me not to judge, everyone has dreams they want to pursue. 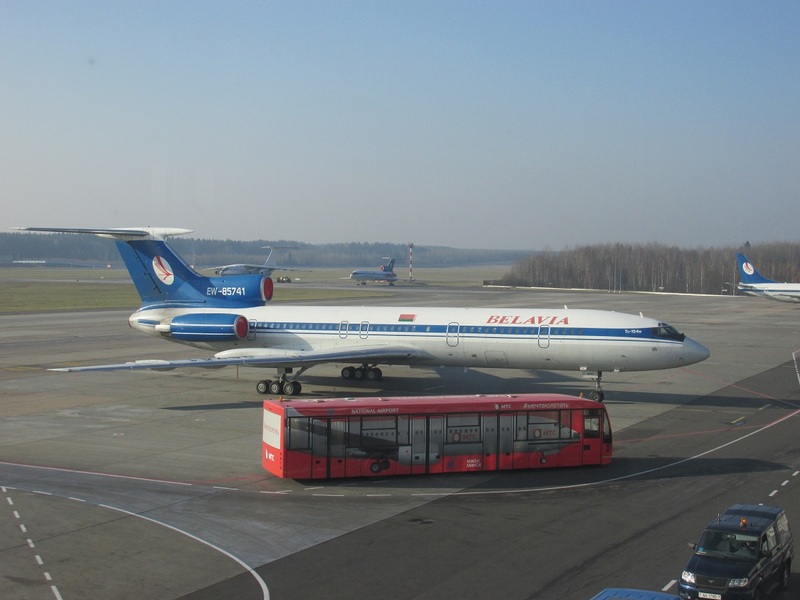 Took my chances on a big jet plane – a TU154 in Minsk. Thanks Ward – enjoyed that, but I think I would have taken the train from Minsk rather than the TU… I just can’t get comfortable with their maintenance. Thanks Bill. I actually flew home on a Lufthansa A320, the TU-154 was sitting next to our gate so I snapped a picture but I agree with you, I’m not sure I’d be comfortable flying on them. Looking forward to reading your story, Ron.